Using remote technology, researchers at North Carolina State University will control cockroaches and use them to help find survivors in the case of a disaster. The roaches will be equipped with computer-chip backpacks, which will be used for data collection. After all the information is collected it will be transmitted to the emergency personnel. Alper Bozkurt, an assistant professor of electrical and computer engineering and adjunct assistant professor of biomedical engineering at North Carolina State University said that after a disaster, like an earthquake, lost people have to be found as soon as possible because their lives depend on it. Currently, there is no available technology to provide this, Dr. Bozkurt added. Cockroaches typically use their antennae to detect objects in their surroundings. When an object comes in contact with the antennae it sends a signal to the roach’s brain, so that the insect knows it is time to change its course around the object that is in its way. Dr. Bozkurt created electrodes that will be attached to a cockroach’s antennae. The electrodes are able to generate pseudo-stimuli to guide the insect’s movements. The backpack – which is like an extinction of the insect’s brain and contains a microchip, microphones, a radio, and a battery – will also be connected to the electrodes. Cyber-roaches will be sent to a devastated area (into a collapsed building for instance) by rescue teams to locate potential survivors. 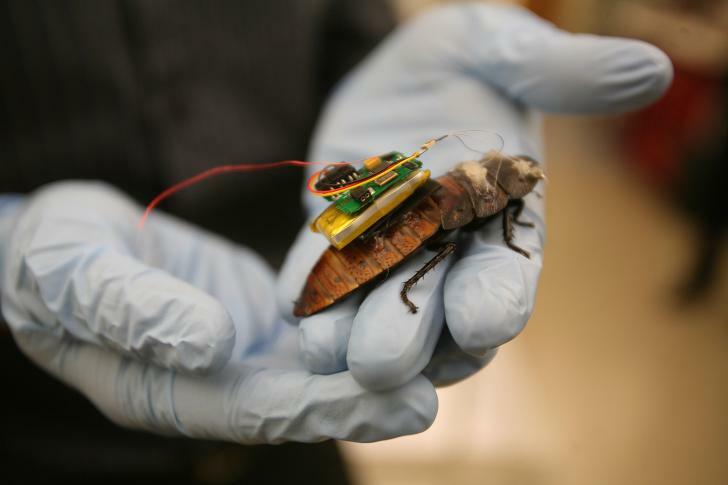 While the cockroaches roam around the area during the search-and-rescue mission, the ‘backpack’ would collect valuable data and direct the insect’s movements, should they go the wrong direction. Beacons from radio towers would activate and locate the roach, as soon as the cyber-insect detects a survivor. To train the cockroaches and test the accuracy of the new technology, the researchers will run simulations in collapsed buildings, Dr. Bozkurt stated. Even though most people despise roaches, Bozkurt says that they are not pests, but exotic insects from Madagascar which some keep as pets. On a funny note, people may think that roaches are ugly, but roaches may think the same thing about humans, Dr. Bozkurt added.